SenSura Click is the new 2-piece standard in ostomy care, offering a unique audible click-lock security ring. The patented click-lock technology provides the ultimate in security, convenience and simplicity with just a click to lock and a click to unlock. When the click system is locked, the pouch is securely fastened to the barrier. SenSura Click combines the revolutionary double-layer adhesive with the added security of the click-lock security ring. Color Coding Reference Guides: Matching Barriers with pouches: For ease in identifying the correct combination of two-piece barriers and pouches, our two-piece products are color-coded. 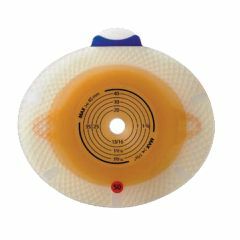 Listed below are the color codes with associated stoma measurements (based on cut-to-fit barrier sizes). After selecting the appropriate barrier, select the matching pouch by color (ie: “blue” barrier matches a “blue” pouch). So satisfied by the product. Great wear time!. Very comfortable.. Easy to apply.. I've been using the convex version of this product for about 3 years, and I can't imagine using anything else! The barrier is soft and flexible. It's easy to apply -- a snap and a click and you're secure! You can hear the bag snap into place, and there is an audible click when the locking ring closes. Once the ring is locked, your pouch isn't going anywhere! It CAN'T fall off or be accidentally pulled off. The only way you're going to have an accident is if there is sufficient force to peel the entire barrier off -- which just isn't going to happen! Belt tabs on the barrier (instead of the pouch) mean you can position the bag at any angle and still have the added security an ostormy belt gives you. I swear by this product. Have never had an embarrassing moment since using it. Oustanding seal.